You’ve relished films, admired coffee-table books, and ogled at online galleries. The scale, the diversity and the beauty of the continent have enthralled you for long. All the while you have nursed a dream — a dream of a pilgrimage to the Mecca of wildlife, to photograph beautiful animals in orgasmic light. Someday, you have promised yourself, you will live it. That time has now come. It’s time to unleash your camera and harvest the riches. It’s time for Africa. A primordial picture — plains, prey and predators teaming up to spawn the most spectacular wilderness site on the planet. To the green at heart, a mention of Africa evokes its primordial picture — plains, prey and predators teaming up to spawn the most spectacular wilderness site on the planet, where large animals still maraud wild and free. And Kenya is its best showpiece. It doesn’t matter that the Roget’s Thesaurus doesn’t say so, but this East African country named after its highest peak really is a synonym for ‘ecological affluence’. With over ten national parks and nature reserves harbouring bounteous wildlife that is easy to view, Kenya is the crème of wild Africa. And that means if you haven’t visited the continent yet, this is your chance. We suggest you grab it. For Kenya is a venue for all seasons. Such is the opulence of its natural treasures, that an infertile visit under Toehold’s guidance at any time of the year is as unlikely as a deluge in the Atacama. Even in the rains. 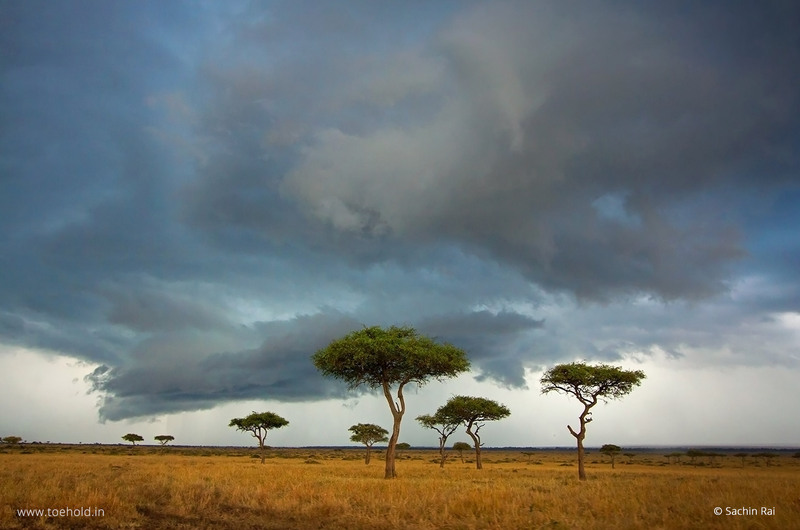 May marks the end of the first of the two annual wet seasons in Kenya. Nourished by the long rains, the grasslands and the woods alike spring spectacularly back to life and shine resplendently in verdant green. The myriad dramas, the triumphs and the tragedies that compose life in the wild show up in a mélange of hues. And topping this spectacle is a blessing from the weather god, who is known to let His hair down at around this time every year. As the day advances, a dark grey curtain of clouds hoists itself down the distant horizon ahead. Behind you, the nomadic wind, never one to be stopped in its ceaseless flight, nudges the water-bearers, exposing for now the nearest star which seizes the moment to bask in its own glow by shining with full resplendence even as a rainbow graces the sky as a giant ornament. In an instant, everything before you has turned into an impossibly exquisite canvas of golden éclat; memories of a lifetime have become enshrined in a moment of magic. It happens only in Africa. A plethora of wildlife. On a colourful platter. For tourists, this is technically the low-season but the wildlife doesn’t seem to know it, for save for the overwhelming numbers of ungulates that are otherwise a prerogative of the Great Migration seen here between July and October, virtually all the other spectacles of the savannah are in due attendance for photography while the off-season rates ensure that you don’t have to sell your house to afford the Tour. Chief exhibitors at the extravaganza are the apex predators and the very emblem of African Wildlife — lions. The relatively easy pickings of the Migration having not yet begun, these custodians of the land must be mobile to earn their dinner, which keeps all the other members of the ecosystem rightfully on their toes. And thus springs a great chance to photograph action and the many unknown facets of natural behaviour that unfurl themselves on the plains each day. The famous venue of the BBC Big Cat Diary series and countless inspiring stories is a theatre of dreams. Masai Mara is where the first-time visitor to Africa starts his love affair with the continent’s wildlife. For, not only does this miniature paradise have a flourishing population of lions and the rest of the big five, it is a most splendid place to photograph them. A part of the Greater Mara Ecosystem and covering 1510km2, the Masai Mara National Reserve is home to what is effectively a bona-fide wildlife-symposium, with over 250 species of birds and a mindboggling diversity of mammals on show. Here lies the best opportunity in Africa to photograph the notoriously elusive leopard, which is often seen arresting the watcher’s breath by flaunting its beauty from atop a tree or on the ground. And where there is a cat, a spotted hyaena with its trademark psychedelic calls is never far away, plotting relentlessly as it does to usurp an adversary’s hard-earned kill. Masai Mara is a land of terrestrial superlatives. The world’s fastest land mammal, the cheetah, is often found sitting pretty on a termite mound, surveying the plains to locate breakfast, while the planet’s largest land mammal, the African elephant, takes its size in its stride as it moves about in genial majesty. The largest living bird on earth, the ostrich, always likes things to be to its satisfaction. And to top all this, the giraffe, the world’s tallest land mammal, uses its ground clearance to look down on one and all from the upper reaches of its slender neck. Decidedly, the denizens of this system appear to love setting records. Rather less ambitiously but with equal beauty, an impressive variety of antelope roam the rolling plains. While the fleet-footed Thomson’s gazelle runs like the wind to preserve its life from its nemesis, the cheetah, the impala glides across the frame like a symbol of elegance. Warthogs and hippopotamuses are always around the corner, while so are diverse birds such as the beautiful crowned crane and the magnificent bateleur eagle. But, without a doubt, the imperious lion is the centerpiece of the wonderland, with the spotlight rightly on the emperor of all he surveys. If there is a better place than the Masai Mara to photograph the iconic African lion, man has yet to discover it. Here, individuals of various ages and standing in lion society may be observed hunting, grooming, resting and copulating on the picturesque open plains in spectacular light, all in the public gaze. Clearly, the most important thing you have to do is being there. One of the abiding images of Africa is a big bull elephant set against the sensational backdrop of a snow-capped peak, looking like a scene from an idyll. It is actually a scene out of Amboseli. This park is so synonymous with elephants that it has come to be known as “Africa’s elephant park” and it affords the unique opportunity to photograph some of Africa’s biggest bulls and other wildlife in spectacular vistas overlooked by the Kilimanjaro, Africa’s highest mountain. The big cat trinity is there too, just so you don’t feel left out. Clearly, you must prepare to be astonished. If Jaipur is the Pink City, Lake Nakuru National Park must be called the Pink Park. For, anywhere between thousands and millions of flamingos throng the eponymous lake of this 188km2 reserve, obscuring its surface as an overwhelming carpet of resplendent pink – a sight that is seen to be savoured. Other attractions of this wetland sanctuary surrounding the soda lake on the floor of the Great Rift Valley include pelicans, Rothschild’s giraffe, flourishing populations of baboon, warthog, Burchell’s zebra and one of the highest densities of white rhino and black rhino. Clearly, extra memory cards are imperative. Ultimate Guide to Your East African safari: Which Kenya Tour Is Right for You? Planning to visit Kenya? We break down the Tour options to help you find out which is the right one for you. Since participants of this Tour travel from various destinations in India and abroad, the Tour commences at Nairobi on 19 May 2019 at around 07:00 a.m. You may either take a flight that reaches Nairobi before that time the same morning, or fly in the previous day and stay overnight in Nairobi (in which case, the cost of accommodation will be additional). Please also note that flight costs are not included in the Tour fee. Our fleet of safari vehicles carrying Skipper Sachin Rai and the park guides will pick participants who have landed in the morning from the Nairobi Airport, and participants who have arrived a day earlier from their hotels, at around 07:00 a.m. Once everybody is on board, we undertake a four-hour drive to Amboseli National Park. A mutual introduction session and a brief by Sachin to set basic expectations for the Tour will be followed by lunch. After lunch will ensue our first safari of the Tour – recipe for a memorable moment for any first-time Africa visitor and something that, even after all these visits, gets Sachin’s adrenaline pumping. Driving through the park will acquaint you with the African landscape and give you but a glimpse of the exciting time ahead. An entire memorable day will be spent out in the picturesque expanses of Amboseli, where views of elephants with the magnificent Kilimanjaro in the backdrop have been specially designed by nature to enthrall. Apart from the pachyderms, we are likely to photograph ostriches, hyaenas, lions, cheetahs and a whole lot of attractive wildlife. In the evening, Sachin will deliver a ChaayaaChitra session before a satiating supper and shuteye call a closure to the eventful day. After breakfast, we depart for Nakuru. Arriving just before lunch, we embrace our home for the next two days overlooking the beautiful Lake Nakuru. Following a scrumptious lunch, we embark on the afternoon safari, seeking the chief spectacle of the flamingo congregation and over 400 other species of birds found here. In the evening we enjoy a tribal dance and celebration before an appetizing supper, and retire for the day. Setting off after breakfast, we spend as much time in the park as we can in order to sight the plentiful wildlife of Nakuru. The early morning drive will be followed by lunch and an evening safari. This being an excellent location to see the elusive leopard, we take our chances to spot the spotted beauty of Nakuru. Efforts will also be made to photograph white rhinos and black rhinos. Between the rides, we meet at the picturesque Baboon Hill overlooking the lake and its flamingo formations, and discuss various topics of nature photography and the natural history of Africa. Meanwhile, here, ultra wide-angle perspectives of baboons, a fixture atop the hill, are a distinct prospect. For participants who want to relax and take the afternoon easy, the beautiful lodge with plenty of trees and a great restaurant is a fabulous place to rest. A rivetting session of ChitraTantra by Sachin before dinner will be a fitting, erudite way of ending the enriching day. After breakfast, a pleasant drive across the dramatic Great Rift Valley brings you through the Narok Township, a major Maasai administrative centre, to Kenya’s most precious wildlife sanctuary, Masai Mara Game Reserve. Masai Mara is home to the colorful Maasai tribe, who may be seen around the borders of the park, with Morans (‘warriors’) loping across the plains, young boys herding goats, or elders grouped under a tree discussing the matters of the day. Wildlife viewing is never dull in the Mara, and patience is often rewarded with unique sightings. By now hopefully the group will have been acquainted with the African bush, so we seek to make the most of the bounty on offer. Staying inside the park will ensure a great experience and early access to photography hotspots, so we may catch a lion pride gearing up for a hunt or a solitary leopard retrieving its kill from the high branches of an Acacia tree merely a few hundred metres from the camp. Every morning while at Masai Mara, we start our day with packed breakfast at 06:30 a.m. and venture into the bush. For participants who are agreeable to spending the entire day in the field, packed lunch boxes will be provided to keep us going the whole day, thereby maximizing wildlife viewing and photography opportunities. An occasional afternoon shower may be encountered but this will in no way mean a dampener, for the animals continue to be seen and what’s more, it will open up the prospect of making evocative images of wildlife in the rain. And when the clouds have passed, the light that illuminates the scene can serve to illustrate the meaning of the word ‘ethereal’ better than any lexicon in the world. Meeting at specific points in the savannah, we learn and discuss various topics on photography and natural history of Africa and the Mara in general. These two days are tipped to be the highlight of the Tour with plenty of wildlife on show. In the evenings a session of CharchaaLoka or simply a question-answer interaction will afford a wealth of learning on a diverse array of photography and natural history topics. While at Masai Mara, based on the group’s inclination, the Skipper will plan a visit to a local Maasai Village for a few hours in the day to learn and understand the Maasai culture, their way of life and their interesting community living. This optional Tour costs an additional USD 30 per person. A ride in a hot-air balloon over the endless expanses of the savannah is an ultimate safari experience. We leave the lodge before dawn, when the sky is clear, the air brisk and the conditions perfect. As the sun rises over the Mara plains, our balloon lifts off – a bright splash of colour rising gracefully into the infinite blue. A stunning panorama unfolds below us and the balloon basket becomes our lookout post for a bird’s-eye view of the Mara’s magnificence. We float silently just a few hundred feet above large herds of wild animals. Upon landing, we celebrate the flight with a glass of champagne, after which the retrieval safari cruisers take us back to our driver. This optional ride costs an additional USD 450 per person. After a scrumptious breakfast, we drive out making sure we arrive by lunchtime at an Indian restaurant in Nairobi. After lunch, we are transferred to the Jomo Kenyatta International Airport for our home-bound flights. The Tour ends but your love affair with African wildlife has just begun. Participants who feel the need to stretch their Tour are welcome to stay back on the nights of 26 and 27 May 2019, checking out on 28 May, to experience two more full days at the Mara at their own pace. The schedule for the two days will remain the same while we venture to deeper areas of the Mara on the full-day game drives, maximizing our chances of bringing back stunning photographs. This extension will be charged additionally. Please express your interest in the extension while booking the Tour to know more. With the extension having come to an end, following an early breakfast, we drive out making sure we arrive by lunchtime at an Indian restaurant in Nairobi. After lunch, we are transferred to the Jomo Kenyatta International Airport for our home-bound flights. EMI Option Available: Talk to us for flexible installment payment options! Payments may be made in equal monthly installments so long as the above schedule is adhered to. Please talk to us for more details. This Tour is open to everybody of a minimum age of 18 (unless accompanied by a guardian), and anybody enthusiastic about wildlife and/or photography will enjoy it. Apart from interest, fitness, a valid passport and yellow-fever and polio vaccination cards, there are no other requirements. You’ll need a Kenyan visa, which is applied for and issued online. More information will be shared, and assistance provided, when you sign up. How many participants will share a safari vehicle on this Tour? Our Photography Tour is designed to offer participants an excellent balance between photography convenience and economy. We’ll be using four-wheel-driven safari vehicles which have large windows and a thatched roof that opens up to give a 360-degree panoramic view for convenient wildlife-viewing and photography. Each vehicle will be shared by only three participants, or three participants and the Skipper, to ensure everybody has ample space to move around and shoot comfortably. Considering the meticulous attention to timing we pay while scheduling Tours and the local expertise we leverage, we believe that it would be extremely unfortunate if our sightings and photography were unsatisfactory. Also, the exhaustive itinerary should offer ample opportunities for a productive time. However, since we will be in an uncontrolled environment, we stop just short of claiming that sightings are guaranteed. A wide-angle or normal zoom is a staple for landscape and general photography. For birds and mammals, a focal length of at least 300mm is usually necessary. An additional 100mm often proves very effective especially for birds. However, if you do not have appropriate equipment, there is no need to fret. Toehold offers an exhaustive array of cameras and lenses for hire, so you can always hire what you need. What’s more, you enjoy a 10% discount on any equipment you hire for the Tour. Visit our Rental Store to see what we offer. A small note to thank you for the great time I had on the two photo tours to Masai Mara and Rwanda. Your organisation was meticulous, something that many professional tour agencies lack in their approach. I eagerly look forward to more such tours. After seeing five different prides of lions, two cheetah hunts, following a leopardess and six days of bliss in the Mara, I can safely say this is one of the best weeks of my life. All I have to say is: just go with Toehold; don’t think about it!